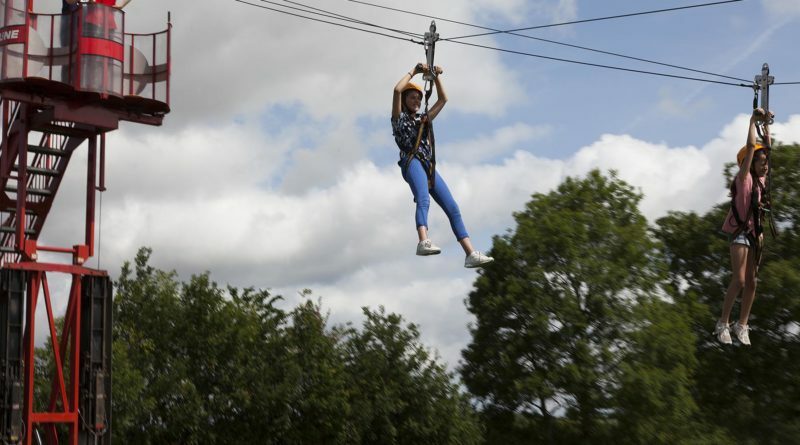 On a sunny summers day Katie Corby of Shipston Youth Club hosted a day of entertainment for the local kids, including zip wire and bands on stage. The Youth Club were supported this year by Pastor Daniel Pulham and his Stour Valley Baptist Church youth workers (Luke, Will, Ester and Kevin) and the Shipston Rotary Club on logistics and registration duties. The entertainment for the kids included a bouncy castle, a Cave (crawl through corridors), Zorb balls, a Zip wire and a climbing wall and a laser quest game area. In terms of emergency services there was a local police car on display available for the kids to go in and explore, with questions being answered by PCSO Emma Turner. Emma works for the Safer Neighbourhood Team, specifically at crime prevention. She was helping by security marking kids bikes and scooters, so they can be returned to rightful owner if stolen and found. The Shipston First Responders (Tony & Stewart) were demonstrating, and letting kids have a go, on the respiration dummies. A great skill to learn that can save lives along with the use of defibrillators. They had their responders vehicle on hand so the kids could see what you carried to emergencies. Other stands for the kids included a face painting stand (well used) and the opportunity with HireaGraffitArtist.co.uk (Rob & Matt) to spray selected colours from aerosol cans over a template, of various animals and birds. Once dry the kids could take their unique designed t-shirt home. Food was provided via the burger/hot dog stand, Taste of the Country (where their newly debuted ice cream of Vanilla and Chocolate Brownie) and the youth club tea bar for hot and cold drinks and snacks. 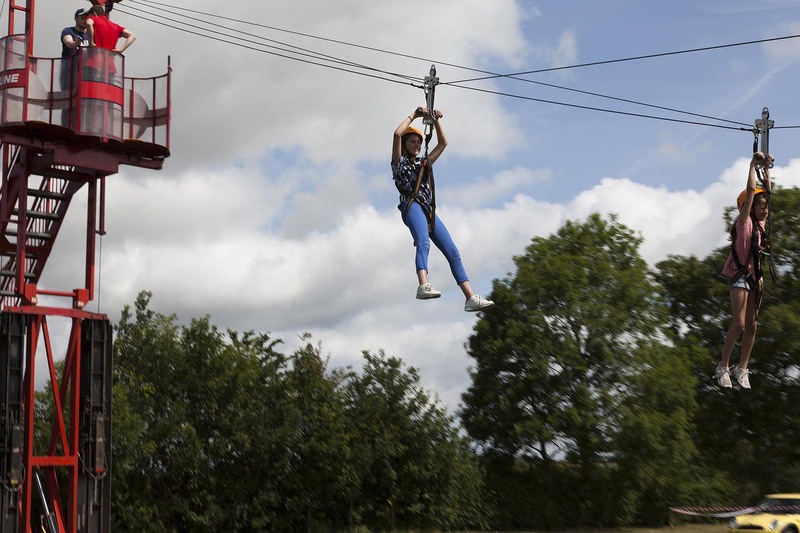 Odin Events were operating the Zorb balls, with three navigating around a course at a time, and Xtreme Adventure the Zip Wire with two going at once. Both of which had long queues of expectant kids waiting for there go. The Shipston Youth Club is very popular with nearly 250 kids between 11 – 16 (though some stay until 18) from the local area attending. The Stour Valley Baptist Church also uses the Youth Club facilities for its services, and has been in operation for over 16 years. There were a couple of local business’s stands including The Attic (Upstairs at M21) with ladies vintage boutique (The Dressing Room) and British handmade and vintage goods (Jimmy’s – James Corby). The Shipston Neighbourhood Plan team (Ed and Paul) were also available to explain some of the upcoming changes, as well as the past history, as they wanted to find out from local residents what they wanted to change or had issues with. On the stage (arctic trailer) we had an excellent display from the Young Dancers group from the Shipston Youth Club and then two acts from Shipston High School. First up we had the Shipston Proms Fame Contest winner (Toby Coffey) who had wowed the Proms Last Night audience in the main square the previous Saturday. Toby sang several songs including “When I was Your Man” by Bruno Mars. This went down well with the crowd in front of the stage along with school friends. Then we had Battered Soul up on Stage. Battered Soul was formed in 2012 by the Head of Music at Shipston High School (David Hunt) as a school music project, but has become so successful that the parents have now taken over the management of the group (which occasionally still includes David on Trumpet). Sadly after a minor bicycle accident the band were without their keyboardist Will Packer, along separately with the trumpets of David Hunt and Abel Wilson, but the group still put on a great show with their set including “Mustang Alley” and Stevie Wonder’s “Superstition”.